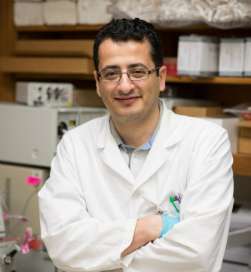 Mamoun Alhamadsheh, assistant professor of pharmacy at Pacific, led research that is featured in the November issue of Nature Reviews Drug Discovery, a publication that spotlights high-impact papers from Nature, Cell and other major scientific journals. Researchers at University of the Pacific have developed a biochemical trick that can significantly extend the lifespan of peptides, smaller cousins of proteins. The finding opens up new possibilities for creating peptides to treat cancer, infertility and other conditions. The research, led by Mamoun Alhamadsheh, assistant professor of pharmacy at Pacific, is featured in the November issue of Nature Reviews Drug Discovery, a publication that spotlights high-impact papers from Nature, Cell and other major scientific journals. "The tremendous therapeutic potential of peptides has not yet been realized, mainly because they can't survive long in the bloodstream," Alhamadsheh said. "In our approach, we tagged peptides with a compound that enables it to hitch a ride on a larger protein in blood. This allows the peptides to avoid degradation and survive in the body much longer." Peptides have been engineered to treat a range of disorders, including cancer and diabetes. These tiny chains of amino acids can be more potent, selective and safe than larger molecules - but their short lifespan demands high doses and frequent administration, limiting their usefulness. "The extended lifespan provided by our technology will allow less frequent administration of the peptide drug, resulting in lower cost and higher patient compliance and convenience," Alhamadsheh said. Added Sravan Penchala, first author of the paper and a doctoral student in Alhamadsheh's lab: "We believe this is a step toward making patients' lives better." Co-first-author Mark Miller, another doctoral student in Alhamadsheh's lab, said the approach has broad potential applications. "In addition to its promise in treating disease, the new technique also has potential to enhance imaging and diagnostic agents," Miller said.